Union leadership also matters, including representatives of both teachers and school support staff. When unions partner with community organizations and the school district, they can more effectively promote a common vision for public education. By their very nature, unions have the organizational infrastructure to organize educators and community members and do what they do best, which is to mobilize and engage around educational issues and student support. In many cases, schools and communities must rebuild, strengthen, and/or create trusting relationships. Those who work in our schools and those who live in our communities have different assets and needs. The only way to provide access to opportunity for all children is for schools and communities to collectively come up with solutions that go beyond organizational self-interests. Effective community schools make decisions by consulting with school staff members, students, parents, and community partners. National and local unions have supported such schools and see their potential. Organized labor and community organizations each bring their own kind of leverage and political power that can help schools and communities work toward a common vision of how to support children and families. In moving the community school strategy forward, we need to be intentional about ensuring that labor groups, school officials, and community members are working together to drive school-based decision making and deepen the work of community schools nationwide. A particular strength of the community school strategy is that it fosters local decision making, so that educators, parents, and community stakeholders can determine what’s best for each child. The school-site leadership team—composed of a community school coordinator, parents, residents, principals, teachers, school staff, community partners, and students—makes school-based decisions that involve planning, implementation, and school improvement. This team also focuses on making decisions that fulfill the needs of students, families, and the immediate community, all the while aligning those needs with academic goals. Helping to create state and local coalitions that can push for policy changes to support and fund community schools. This work is taking place in Baltimore, New York City (pictured to the right), Philadelphia, and Pittsburgh. For example, in partnership with the Alliance to Reclaim Our Schools, local and state union affiliates have formed statewide coalitions to advocate for state community school legislation. Ensuring that community schools are part of political platforms, including in mayoral races and school board elections. The United Federation of Teachers collaborated with community organizations across New York City, including the Children’s Aid Society, to make sure all 2013 mayoral candidates included the expansion of the community school strategy in their platforms. As a result, after his election, Mayor Bill de Blasio made a commitment to invest $52 million to create more community schools. Additionally, the Pittsburgh Federation of Teachers and the organization Great Public Schools Pittsburgh specifically endorse school board candidates based on their commitment to bring community schools to Pittsburgh Public Schools. Building awareness around the community school strategy in their communities and with their members. Education on what community schools are and how various stakeholders can get involved is crucial to ensuring that union members, community members, parents, students, and others are part of the conversation when it comes to creating community schools. For instance, the Baltimore Teachers Union created the Education Roundtable in partnership with a variety of stakeholders—the Family League of Baltimore, the American Civil Liberties Union of Maryland, Maryland Communities United, CASA de Maryland, and the Baltimore/Maryland Central Labor Council, among others. Together, they are building awareness around community schools by holding trainings at schools for their members as well as for community members and parents. Using this strategy as common ground for labor-management relationships. Conversations with school districts around the creation of community schools must take place, even in the instances where strong relationships don’t yet exist. Ultimately, having labor groups, community members, and management working together on this strategy will be a key factor in its sustainability. For example, in Cincinnati, where community school work has been taking place for more than 10 years, the superintendent closely works with the Community Learning Center Institute (which leads the district’s community school effort) and the Cincinnati Federation of Teachers. Thanks to this partnership, the school board implemented a policy that codifies the community school strategy. Portions adapted with permission from “The Power of Community Schools” by Natasha Capers and Shital C. Shah, Voices in Urban Education, no. 40 (2015). Male students at John Hancock College Preparatory High School, a community school in Chicago, are building character and learning how to solve conflicts in Becoming a Man, a dropout- and violence-prevention program that helped inspire President Obama’s My Brother’s Keeper initiative. And Working on Womanhood is doing the same for young women. A signature program of Youth Guidance, the lead agency at Hancock, Becoming a Man provides students with mentorship experiences and peer support. Group sessions, field trips, and afterschool sports focus on developing social-emotional skills in young men through stories, role playing, and group exercises. The lessons are intended to teach impulse control, emotional self-regulation, and how to read social cues and interpret others’ intentions. An evaluation by the University of Chicago Crime Lab found a 44 percent reduction in violent crime–related arrests for students in the program, and at Hancock, there has been a decline in school suspensions since Becoming a Man began. While school staff members refer students to the program, many students also “self-refer” because they want to be part of the enriching field trips and afterschool sports activities, says Kathryn Rice, Hancock’s resource coordinator. The creation of a care team, consisting of community partners and school staff members, has helped to increase the attendance at the school from 78 percent in 2010 to a current all-time high of 88 percent. Every other week, the eight-member team pores over names of students considered at risk and plans strategies for improving outcomes for those students. Because of that structure, “We don’t have students who just slip through the cracks,” Rice says. “Leading collaborations” is how the Family League of Baltimore describes its work to improve outcomes for Baltimore’s students. This approach was apparent three years ago when the league made a strategic decision to require social service organizations and other community groups that wanted to work with afterschool providers to demonstrate a commitment to community schools in order to receive funding. The goal was to create a more integrated approach to improving outcomes for students through an array of enrichment, health, and social support programs for students and their families. Participation rates in afterschool programs have increased, and because each of the city’s 45 community schools has a full-time coordinator, Baez says there is “constant communication” involving teachers and providers around which students would most benefit from additional learning and enrichment in extracurricular activities. Students who attend afterschool programs for at least two years have higher school attendance rates and are less likely to be chronically absent. The Family League has also devoted considerable resources toward making sure new community school coordinators and community partners develop the skills that will help them be more effective in their roles. In 2014, 113 professional development opportunities were provided, reaching roughly 1,400 participants. Sessions for coordinators included topics such as the Common Core State Standards and youth development best practices. The growing support of the community school model throughout the city is also being reflected in organizations such as the Y of Central Maryland, which has made community schools one of its priorities. Community schools are a central piece of the city’s plan to renovate or build new schools. Collaborative spaces will be included in the design of buildings, health services are being planned, and schools will be open extended hours to meet the needs of students, families, and community members. Visit www.bit.ly/1fhBSon to watch AFT members discuss the importance of community schools. 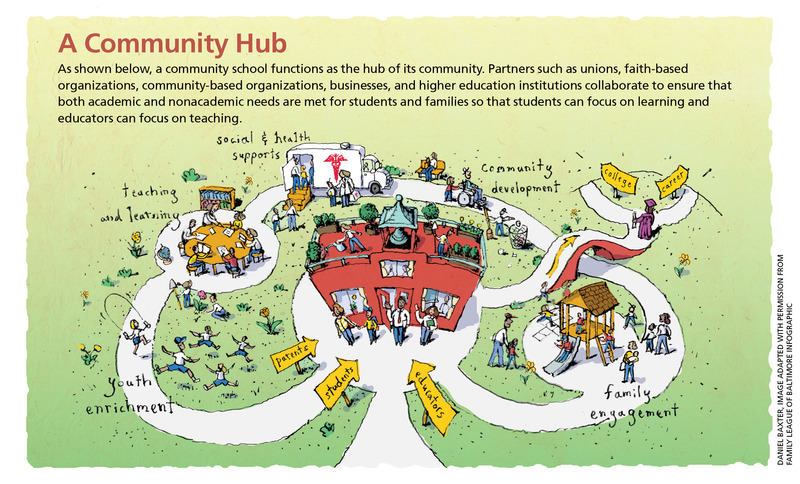 Visit www.bit.ly/1JbFkg8 to learn more about what makes a school a community school.